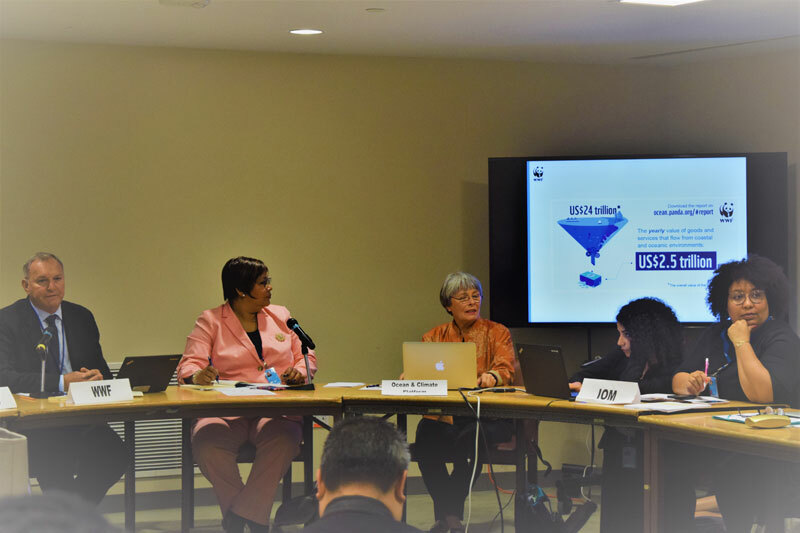 United Nations - As part of the first-ever United Nations Ocean Conference, the UN Migration Agency (IOM) held a side event on Ocean Health, Climate Change and Migration: Understanding the Nexus and Implications for People on the Move. In partnership with the World Wildlife Fund (WWF) and co-hosts, the Permanent Missions of Madagascar and Ecuador, the event provided an opportunity to contribute to the conference goal of supporting the implementation of Sustainable Development Goal (SDG) 14: Conserve and sustainably use the oceans, seas and marine resources for sustainable development. Moderated by Rosiland Jordan, UN Correspondent for Al Jazeera, the event included a diverse audience of Member State representatives, civil society, academics, scientists, journalists, and NGOs. Presentations by panelists including John Tanzer (WWF), Jean Randrianantenaina (Regional Maritime Information Fusion Center, Madagascar), Francoise Gail (Scientific Advisor, Ocean and Climate Platform), and Mariam Chazalnoel (IOM), covered key issues including direct consequences that climate change-related modifications to the global ocean have on island and coastal populations as the environment, economy and livelihoods of many of these communities depend on oceans. Practical examples were provided regarding how these negative impacts influence the migration patterns of affected communities as well as the daily lives of communities receiving migrants. Ashraf El Nour, Director of the IOM Office to the United Nations, expressed concern about the displacement of communities and impact on human settlements who live near and rely on the world’s oceans for their livelihoods. He noted that, according to the Internal Displacement Monitoring Centre (IDMC), 24.2 million people last year were displaced due to natural disasters in the world, principally floods and storms, many of them made worse by the climate change impacts in oceans’ coastal areas. Slow environmental degradation in coastal areas, such as sea level rise or coastal erosion, are also expected to have long-term impacts on migration as people move preemptively to find alternative livelihoods or are forced to relocate inland. The thematic focus of the event was directly relevant to several Partnership Dialogues (PD) of the Ocean Conference: PD 2 (Managing, protecting and conserving marine and coastal ecosystems), PD 3 (Ocean acidification), PD 4 (Making fisheries sustainable), and PD 5 (Increasing economic benefits to Small Islands Developing States and Least Developed Countries). Partnership Dialogues are interactive and multi-stakeholder in nature, focusing on recommendations to support the practical implementation of SDG 14. The Ocean Conference is a key opportunity to bring questions of migration and oceans to the fore, especially as the international community prepares for the COP23 climate negotiations in Bonn, Germany, this November 2017.